Meet Olivia Jordan, a 26-year-old college graduate from Boston University. She seems like she could be your typical millennial woman aside from the fact that she was recently crowned as Miss USA 2015. I had the opportunity to speak with Miss Jordan about setting goals, growing up in Tulsa, and dealing with haters. One thing that can be said about Miss USA 2015 is that she is much more than a pretty face. Miss USA 2015, Olivia Jordan is recognized by the City of Tulsa and September 24 is declared Olivia Jordan Day. What is a typical day like as Miss USA? It’s always changing. I wake up around 7:30 or 8. I have breakfast. I go to the gym. We work with an amazing gym and trainer this year so I work out there. I shower, get ready for the day, come to the to the office which is just around the corner from my apartment and catch up with them. I do some amazing phone calls and catch up with what we are going to be doing that day and for the week. I do some volunteer sessions for a few hours each week with different organizations in New York so that has been lovely. And then I also go to events all over the city. I go to movie premieres, fundraisers, and books signings. Every single day is different which is one the exciting parts of the job because you never know what you’re going to get each day and every day is an adventure. I also enjoy seeing new parts of the city and meeting interesting people. For example, I had the opportunity to meet Martha Stewart and Meryl Streep. What’s the best thing about being Miss USA? There are so many things. It has completely changed my life. Moving to New York has been unbelievable and incredible and I am so grateful for the opportunity to live here in this amazing apartment. Probably the best moment as Miss USA so far was that I got to be a co-host on the Fox Good Morning New York show and I had such a good time. That was something I had never done hosting for television before and I had such a good time doing it and we were able to cover so many important topics. I loved that experience and that is something I wouldn’t have done had I not been in this position. What is the hardest part about being Miss USA? The hardest part is the critics that come out of the woodwork. I was working as an actress and a model, but I didn’t have a social media influence. I also wasn’t being talked about in the media and the night that I won all of that changed. I immediately gained a huge social media following, and I had a million new fans, but I had many, many new critics. So it’s just about trying to stay above that and not letting people get to you when they are saying hateful or mean comments about your body, about you, about what you’re doing. There are always going to be some critics out there and rising above that is the most challenging part of the job so far. How do you stay above that? I am lucky because I am 26 years old and I know who I am and what I stand for. I actually know a lot of my strengths and my weaknesses as well. The hard part is when people actually do point out those weaknesses. But I know those are things I am working on or that I have accepted about myself. To me, you have to do one or the other. You have to accept your flaws or work on them. And other than that you cannot let it get to you. You try not to read all the Instagram or facebook comments because they can get vicious. What are some of your goals now as Miss USA? I am so excited because this coming month I get to lobby in DC for ovarian cancer. That’s a huge thing that I want to be able to do. I want to make a difference this year and I think lobbying in DC is a huge way I can raise awareness about this cause. I can help increase government funding to get more research around ovarian cancer and help a woman’s cause which is incredible. While I’m there I will also be talking about the Alzheimer’s association. I’ve been working with the Alzheimer’s association long before becoming Miss USA and I am excited to continue my work with them and continue spreading the word and get closer to finding a cure for Alzheimer’s. What other organizations are you working with? It’s a little hard since my heart is pulled in so many different directions. There are so many causes I want to work with and so many amazing causes out there and hard issues that were dealing with in our country and globally. But I am trying to focus on the few that I have chosen so I can really make a difference this year and get people talking about them. I think getting people talking about them, raising money, raising awareness around them are huge steps for finding a cure for Alzheimer’s getting more research for cancer and breast cancer. I also work with getting kids out of prostitution in the United States and that I think is so much about awareness. The more awareness we have the more funds we can raise to get kids into shelters and help protect them and find better methods to get these criminals off the streets. With that being said, what would you consider to be the biggest obstacle to women in America right now? There are so many and I wish that there weren’t. A huge thing we are dealing with is pay equity, and it is something we’ve been dealing with for SO LONG it is just time to overcome this because I feel like once we overcome that, then we are going to be so much closer to equality in all ways. And It’s going to be easier to protect women and I just want to get to a better place [of] equality between men and women. What made you first decide to compete in Miss USA pageant? I was working in Los Angeles as a model and actress. I was brand new to the city. I had just graduated from Boston University. And I honestly didn’t know a lot of people and didn’t have a lot of connections. I was in a brand new field; the entertainment industry is a crazy industry. And I saw pageants as an opportunity and to meet people, network and to finally have a voice. I had been working as a model since I was about 14. And as a model you are kind of just a prop really. Your job is to promote a product and people don;t really ask your opinion and let you have a voice and I saw pageants as an amazing opportunity to speak about causes that are meaningful to me. What has the Miss USA process taught you about attaining goals? So much! I studied health science in college and a lot of what we talked about was goal setting and the psychology behind that of how important it is to set achievable but difficult goals. That is something that I really practiced since learning about it. It is so good for me to set these goals. Once I set the goal to become Miss USA I could not let it go. I tried to let it go. A couple of years ago after I competed in a couple of pageants and had not won the title yet I tried to let it go and I couldn’t because I set that goal and it was out there and I saw the possibilities that could come from it. And it is just so incredible to keep working towards a goal and keep improving yourself and seeing areas that you can grow and be better and stronger and smarter and more influential. And I learned so much through the process of goal setting and then I achieved the ultimate goal that I had been working on for over 3 years which is an incredible feeling. Miss USA 2015, Olivia Jordan enjoys attending a Bishop Kelley home football game at her former high school. I am really passionate about health, fitness and acting. Those are my biggest things. I ultimately want to be the star on a sitcom. I want to make people laugh for a living. In my eyes I think it is just the greatest honor to be able to do what you love and be passionate and make people laugh. Ultimately I would like to do the Jane Fonda thing with my career and combine my love acting and comedy with eventually becoming a fitness mogul and inspiring people to be their most fit, healthy and happy selves. What is your morning beauty regimen? I’Il try to keep it really simple! I am a big believer in good skin care so I definitely use Vitamin C serum to protect my skin before the day. I put on just a little bit of a tension moisturizer, a little blush, bronzer, mascara, and lip gloss. On those big pageant days I have to do it up a little more, but I think most of the time you need to take care of your skin a chance to breathe so I try to keep it simple and natural and try to be comfortable showing the world my natural self rather than always having to be on with the full eyelashes and the tons of foundation and all those things that make us look great but aren’t necessarily realistic. So many people have inspired me. It’s a long list. My biggest inspiration is my grandmother. She is the most loving person that I have ever met and she has truly impacted everyone that she ever met on how much she could just connect to people and share her love with them upon meeting people. It was an incredible gift to make someone feel loved when you met them. how much she could just connect with people. it was incredible to make someone feel loved when you met them. And that was very inspiring to me. And she taught me to be myself and to always be nice to people and focus on giving back and being generous and all of those things are going to enrich your life way more than any amount of success. It’s all about the people that impacted and the people whoa re close to you in your life. What’s it like growing up in Tulsa? It was the best! Tulsa is such a good place to grow up. I lived in midtown Tulsa in a really tight-knit community. We knew our neighbors and we would go bike riding and would have block parties on our street corners. It was an amazing place to grow up. I am still very close to so many of the people that I grew up with which is incredible. We always made the joke growing up that it takes a village to raise a child and Tulsa really does work that way. Everyone is looking out for each other and it’s a really connected and generous community. So I learned a lot from that place that giving back is just a part of life and it is an important part of life and we always have to look out for people who have less than us and that was such a priority. Those were all things I was raised with which is an incredible gift. I saw that you loved puppies. Do you have any pets of your own? This year living in New York and traveling, I can’t have a pet, here but my parents have an adorable a pug named coco and my sister has another adorable pug named Cinnamon. Also, my grandpa has a cat named charlie. So we always grew up with pets. We had sort of a revolving door of different cats and dogs that we found on the street and adopted and found new homes for. My whole family loved animals so I was very lucky to grow up with that in my life. After this year once I get more settled I will definitely have to go back to having a dog in my day to day life. What advice would you give to the next generation of women who are trying to achieve their goals? That is such a good question. And the mission of your magazine is so in line with my personal mission is just to inspire people to live the life of their dreams. So I think my best advice is to be fearless. I think when I was in my teens my dreams felt too big. It felt too big to want to be Miss USA to be a television actress, to be a model. Those were all such elite careers and in my head I did not think they were possible for me and I had to get a little bit fearless and not worry about failure. And I have I have failed so many times but have learned from all of those experiences and I’ve grown and I had accomplished so many of the dreams that I had set out to do and so many things that honestly I did think were possible. I would love to just encourage people to be fearless, go after those things you want and if you get it it is the most incredible feeling in the world. If you don’t you will learn and grow and find a new goal and live your dreams. It is an incredible feeling. While you are being heroes, while you are chasing your dreams remember to lift people up. There is no need to be negative. That negativity reflects poorly on you so just be positive and keep positive people around you. Lift up your friends and the people who are following their dreams because we’re all going to do it together. There are enough dreams for us to go and catch them so lift up the people around you. Life is not a competition, it’s about everyone living the life of their dreams and from that incredibly passionate place where you get to do what you want to do in life we all succeed and we all can make a better impact on the world. It starts with being nice. That’s what my grandmother would tell everyone. 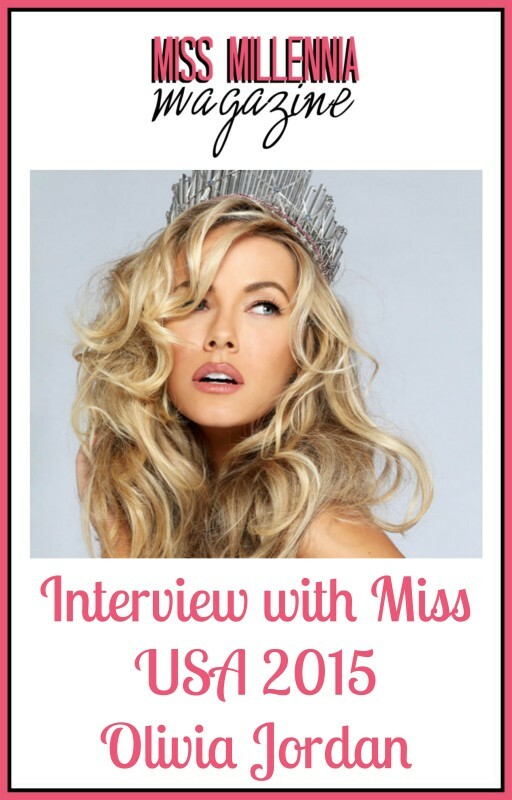 We at Miss Millennia are so happy to have had the opportunity to speak with Miss Jordan and want to encourage you all to follow your dreams. Miss Olivia Jordan is a fine example of reaching for the sky when setting your goals.